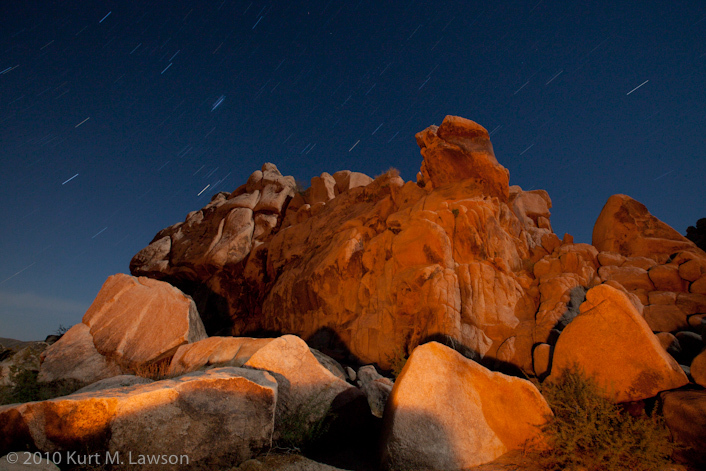 Last night I was in Joshua Tree National Park again. This time it was not a backpacking / photography expedition. However, as I am compelled to do, I brought my camera gear along. At one point I realized that I might be able to take some photos of our camp. I also realized that our huge camp fire was lighting up the surrounding rock walls. So, I set the camera on my tripod and let it go to work. I was blown away when I saw the results! “Wow!” is what I thought when I viewed this on the tiny LCD monitor. Blown away, I did a second exposure with far less desirable results. Despite the identical exposure, the fire died down significantly and there just wasn’t enough light. So, I decided to try something else. 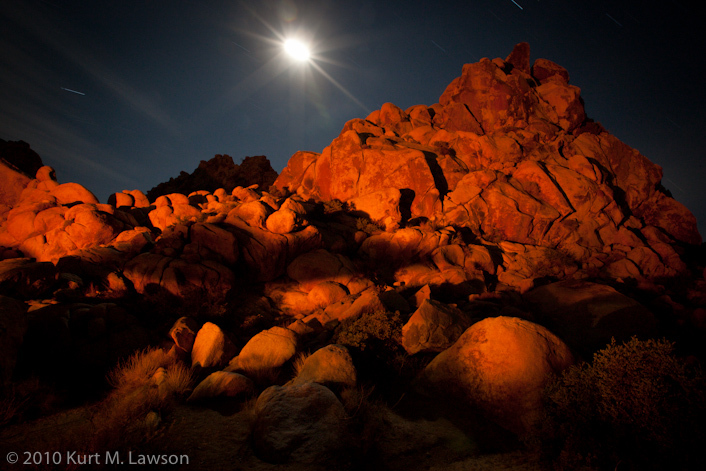 I set the camera up again, knowing that the moon was soon to disappear behind the rocks. This time after I clicked the shutter I beefed up the fire with the help of a fellow camper and spent the next 12 minutes painting the rocks with the fire as I constantly added bits of bright burning cardboard and additional wood. The result? 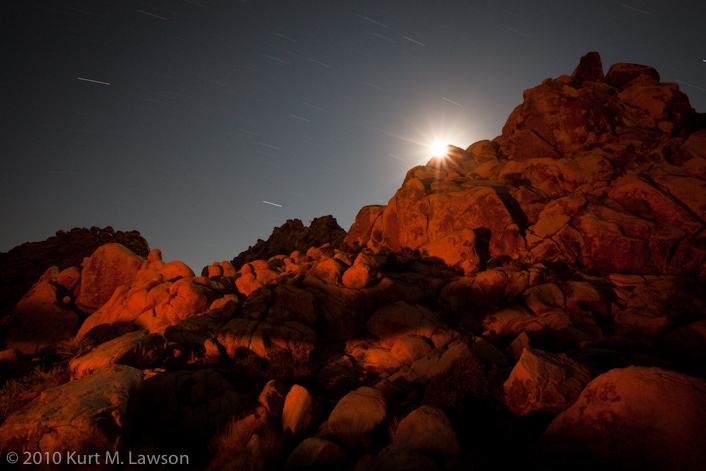 The starburst effect of the moon shot with a small aperture (f/16) just as it dipped behind the rocks. After this I gave up on this composition and tried a few others near the fire. These shots combine some moon light (as the moon was still visible from the other side of the campground) with the fire light. Shortly after this last one I the last bit of moonlight faded from the foreground rocks. I elected to head for my sleeping bag, but discovered there was enough light (and I had just enough energy) to try one more purely moonlit shot from a few hundred feet away from camp. And finally, here are the two best shots of camp that led to all other night shots from the trip. Yours truly can be seen in the second one, semi blurred, somewhere in there. Nancy - Kurt…I’ve never seen photography quite like this. Your pictures are truly amazing!!!!! Thank you for sharing your talent with us. What a gift. Nancy Lehrer - These images are great. Your blog was forwarded to me by Suzanne Tanaka. Brittany - Kurt I love the pictures you’ve posted- thank you for sharing not just your pics, but your experience while shooting them as well!